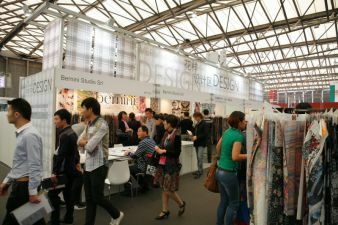 As with many of the product zones and pavilions at Intertextile Shanghai Apparel Fabrics – Spring Edition 2015, strong demand from the domestic industry is attracting more exhibitors to this year’s Verve for Design zone. This zone features creative and original fabric pattern designs which are targeted towards the mid-range and high-end markets, and with 14 exhibitors from five countries and regions participating this year, it more than doubles in exhibition space compared to the 2014 Spring Edition. The fair, which runs from 18 – 20 March and is held at the brand-new National Exhibition and Convention Center, will feature over 2,500 exhibitors across more than 100,000 sqm. The Verve for Design zone was introduced in response to the growing middle and upper classes in China and their strong demand for original pattern designs. To date, companies from Australia, France, Hong Kong, Italy and the UK are confirmed to take part. Repeat exhibitor in this zone Longina Phillips Designs from Australia is just one of those to notice this demand. “As we’ve expanded into the Chinese market, we’ve seen a distinct demand for original artworks emerge,” Senior Designer Shannon Cheung outlined. “We’ve also developed strong relationships with clients in Hong Kong and Japan for our designs too.” Longina will exhibit a more sophisticated collection called 'The Print Room' that is tailored to the high-end market, as well as a more diverse and wearable 'The Longina Range' that is more suitable for the mass market. Aglaia Design Studio from Hong Kong also sees a “growing need for unique print designs” in China according to Design Manager Bonnie Chan. They will showcase their new 2015 spring / summer print collections at this year’s fair. Another featured exhibitor is Circleline Design Studio from the UK who will showcase original designs for a wide range of products, “from underwear to haute couture” according to the company. Intertextile Shanghai has always been a platform to discover the latest trends and fashions and this year is no exception. The Intertextile Directions Trend Forum (hall 7.2) has been developed by the Intertextile Directions Trend Committee which is comprised of industry experts from New York, Milan, Paris and Tokyo, and features an overall season theme and three individual themes this year. • Slow Time (season theme): getting back to basics and fully appreciating products’ simplicity and natural materials. Give prominence to know-how and functionality. Enter a realm where ethnic tradition unites with folklore. • Country Club: take time for a chic elegance. Simplicity is the new elegance and sophistication. More respect of trust and in essential objects leading to a rejection of excess. It is about balance and accuracy. • The Prince Gardener: take time to respect nature. Inspired by the fundamentals of nature, minerals and plants are helping with the search for truth. We pay tribute to the rural world, handicrafts and workwear garments. • Wanderlust: take time to travel. Style mixed with new frontiers and inspirations to keep an authentic aesthetic. From an exotic-land to a festive mood, it is all about hyper mix. Four concurrent textile industry events also take place at the same venue. Yarn Expo Spring, PH Value (previously known as the China International Knitting Trade Fair) and CHIC, the 23rd China International Fashion Fair, will also run from 18 – 20 March, while Planet Textiles 2015: The Sustainable Textile Event will be held on 19 March. Intertextile Shanghai Apparel Fabrics – Spring Edition 2015 is co-organised by Messe Frankfurt (HK) Ltd; the Sub-Council of Textile Industry, CCPIT; and the China Textile Information Centre.